I might live in the grittiest city area of O‘ahu, but at least I can hop over to a neighbor island on the weekend and treat myself to this! I was born and raised in Hawai‘i, but there is an astonishing amount of things I haven’t personally done. I’m trying to tackle a bit at a time and, as a local, trying to find the real heart of what makes spending time in the islands most rewarding. Plans don’t always pan out: sometimes the fancy restaurant gives you a fried egg on your Eggs Benedict as part of their “style” and, if you’re like me, that can really dampen your brunch experience (brunch is my top Sunday priority)—but it’s important to remember that you’re there to experience the aloha of the Islands and embrace the big picture of your experience. Love the little things. Ka‘anapali Beach has shore-breaking waves that are, frankly, massive. Sorry no banana for comparison, but they are no joke. Never turn your back to the ocean. Ever. Not only will you get pummeled, you can get sucked in and pulled out to sea. Sun, sand, panoramic views, a nice breeze, soft (and very satisfying) sand and people-watching. You can see the neighbor islands in the distance, and I imagine the sunset view from here is extraordinary. That point at the end is called “Black Rock,” and is the point where spirits travel to jump into the next world—so they say. A nightly (I believe it’s nightly) ritual is performed where a man leads the spirits to the point, blows the conch shell and jumps, and people (with more guts than me) jump off of it all day long. This beach is just loaded with character. It can be a little crowded, but is definitely worth a visit. 2. Whale Watching – I was always under the impression that taking boats out to view the whales would compromise their comfort, and I’ve been strictly against it forever. However, my local guy and his family have apparently done this a dozen times, so I made an exception. It turns out, accordingly to our whale watch guides (and what could be inferred by the whales’ behavior) that they don’t give a single fin about us being there or not. We aren’t even on their whale-dar. Our guides were very enthusiastic, knowledgeable and personable. It was like being on a cruise with a bunch of your good buddies. By the way, you can thank Trilogy Excursions (within Kaanapali Beach Hotel) for all my terrible whale puns. They were quirky people with great senses of humor. And if that weren’t enough, they make some really fine ginger ale. Anyway, there was an astounding amount of information shared on the whale tour about migratory patterns and general behaviors. The guides were likening the whales’ behavior to our own, which made every tidbit hilariously entertaining; males fighting over women, females slapping the water to let the males know they were in the area (like a social media update). If we’d seen only a few whales from a distance, I would have been satisfied—it was that entertaining. A pectoral slap in the distance. 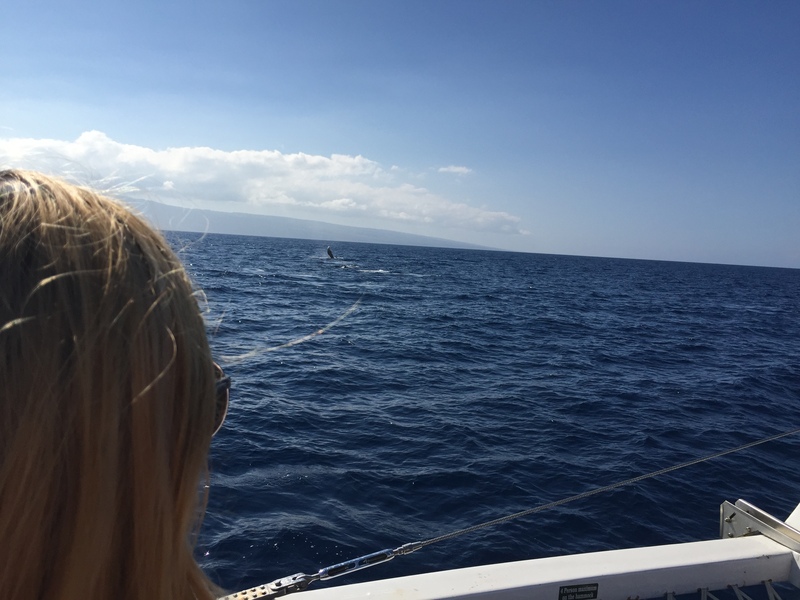 We actually got up close and personal with the whales as they came right up to the boat several times. We only saw a full breach at a distance and no whale eyes looking dramatically into our own and peering into our souls, but they came across the surface close enough that I could count the barnacles on them. Thanks, Trilogy Excursions. It was a tremendous whale of a time. Hyuk hyuk. 3. Happy Hour at Hula Grill – Fortunately or unfortunately, companies are liable for their consumers’ inability to properly board a catamaran, so our Saturday whale watch time was postponed until Sunday due to the rough shore break. Not quite the cocktail I was really craving, but it will do. Making the most of it, as we are wont to do, we grabbed a table at nearby Hula Grill Ka‘anapali and ordered some beach-side grub. Might as well take advantage since our parking validation lasts all day. I actually didn’t order any drinks, since apparently my potential future in-laws think I might have some kind of “drinking habit,” which isn’t not true. I’m on vacation, but I’ll sit this one out anyway. 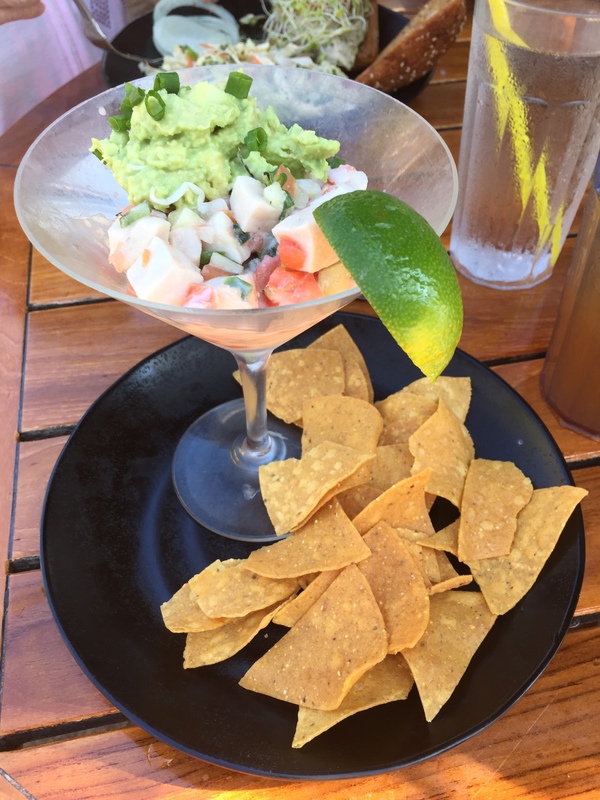 What made this happy hour great was not even the ahi ceviche, which I swore I would never order but truly enjoyed. Remarkably, even though we missed our whale watch that day, several whales swam into the harbor and were putting on a show right by our table! A mama whale was teaching her baby how to breach. I couldn’t take my eyes off of them. Funny that after 27 years, born and raised in Hawaii, I’d never seen this before. 4. 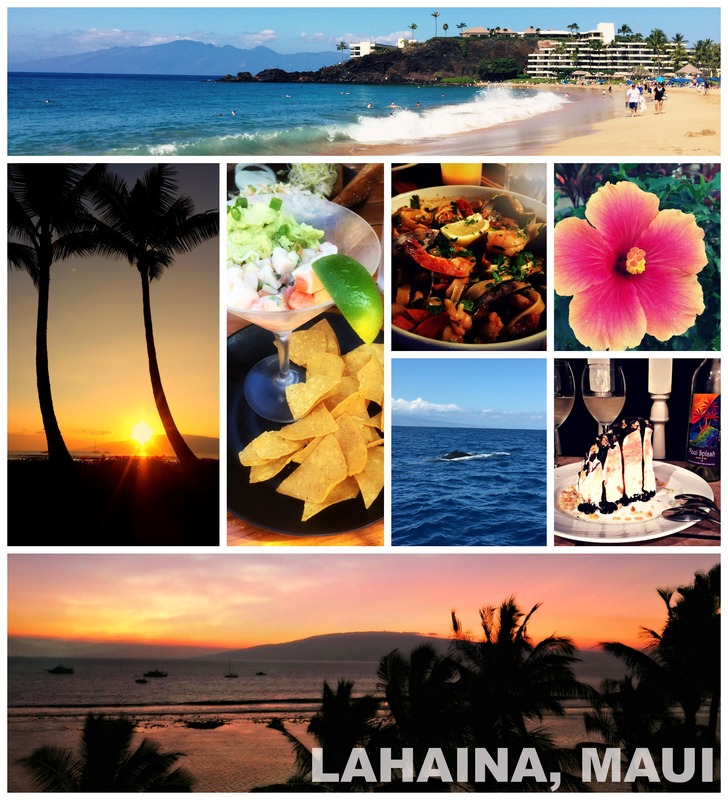 Sunset Dinner – We’d been going to Koa’s Seaside Grill for several days, since my favorite place on Oahu, Moose McGillycuddy’s, closed down its Lahaina, Maui location, and nearby Kimo’s next door seems to always have a 45-minute wait. Koa’s Grill actually projects further across the water than Kimo’s does, giving it a pretty stellar view. 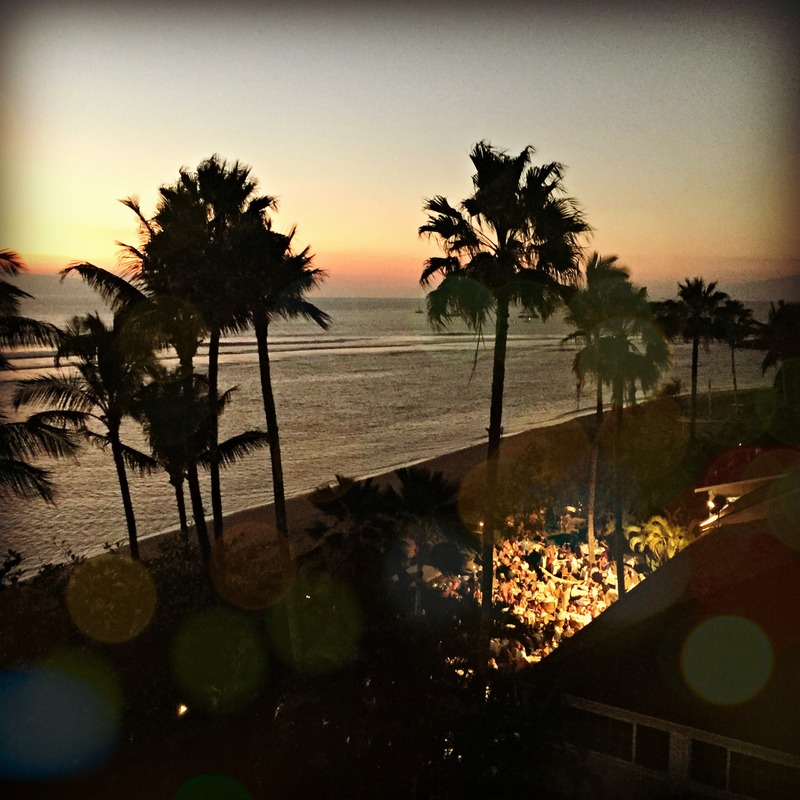 But not as good as the view from our Lahaina Shores oceanfront suite. Wouldn’t you have dinner sitting out here every single night of your stay? I would. We had gone to Koa’s numerous times, with only one disappointing experience (Eggs Benedict requires a poached egg, how do they not agree? Fried egg on a Benny? For shame, Koa’s! ), but we were ready to go again until we realized we weren’t made of money, so opted to grab some takeout and enjoy an oceanfront dinner from our lanai (patio) instead. Should’ve brought some binoculars to watch the Feast at Lele luau next door. We grabbed a hula pie (that decadent heart attack pictured in the collage) from Kimo’s and a bottle of wine the first night, and some mediocre pasta from Penne Pasta the second, with another bottle of wine, obviously. We were privileged to have a suite not only facing the ocean, but overlooking a luau next door where we could watch fireknife dancing and hula performances for free, at Feast at Lele. Pretty suite deal. 5. Doing Nothing – Did I mention the oceanfront suite? Falling asleep and waking to the crashing of waves in the distance at Lahaina Shores Beachfront Resort was unbelievably relaxing. I could definitely get used to this. The contrast between the sun slowly setting and the plantation-style décor confused my camera, so sorry ’bout it. They don’t have hotel amenities like laundry and room service, but there are shops nearby for food, washer and dryer down the hall, and the turn-down service was bright and friendly. 505 Front Street was literally next door. 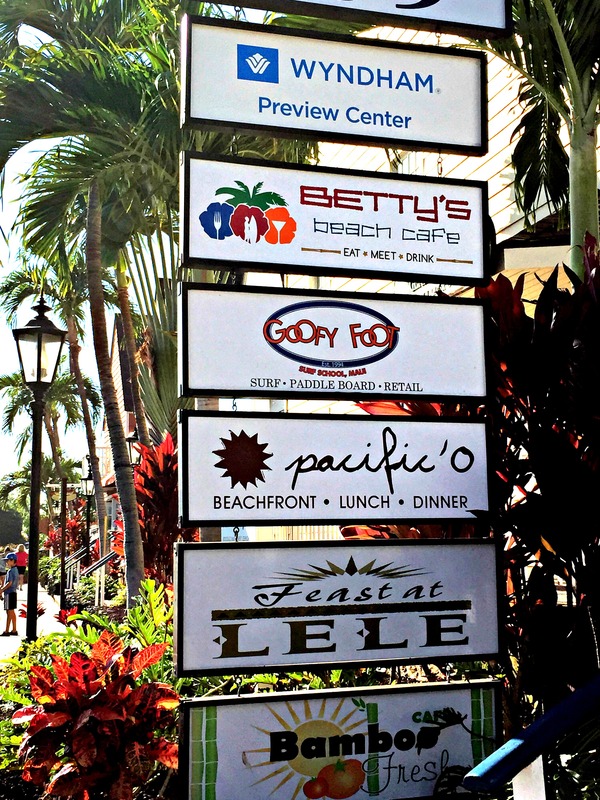 It was a great coincidence that the 505 Front Street complex was next door, because Sunday was the Maui Marathon and there was no driving out of there. Luckily, Betty’s Beach Café has “Mimosa Brunch” where mimosas are $2 each with breakfast, where we could watch the Seahawks game and watch the waves (and marathoners) roll in at the same time. That Bamboo Fresh is pretty good too. It took a long while to make a proper smoothie, but let me tell you: that burst of nutrients during a three-day weekend of full entrées was exactly what I needed. They also have salads and sandwiches—basically anything light if you’re heading down to the beach that day. We didn’t even make it to the actual toes-in-sand beach on the third day. With the waves right outside our sliding doors and breakfast on our lanai, what’s more to want? I did, however, take a break from my intense in-room relaxation session to read my book poolside and watch the sun set from the shoreline. Lahaina, Maui. Go see it.